Consider joining the Knights of Columbus Lawrence Council 7000, a fraternal organization dedicated to serving our parish and the community. Who are the Knights? 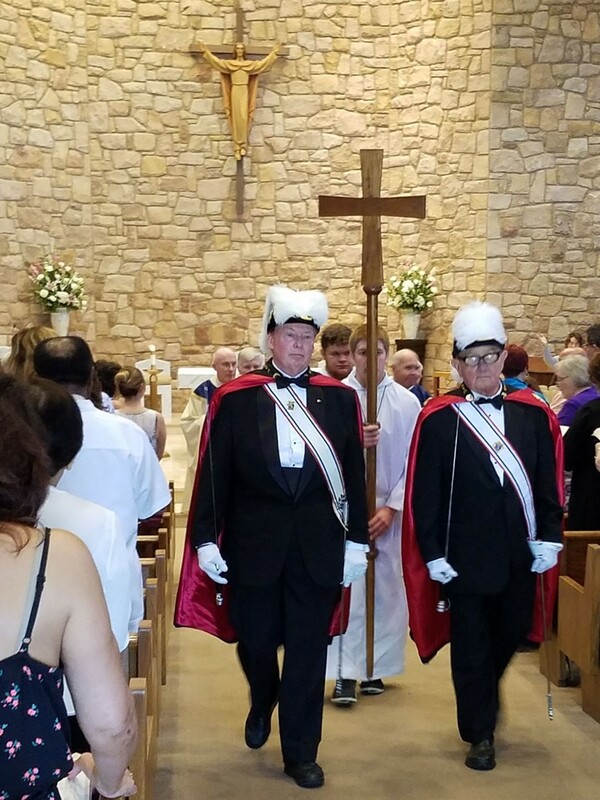 We are your fellow parishioners—the local policeman, businessman, teacher, or retired man in the next pew at Sunday Mass. A Knight is a Catholic gentleman who loves God, his family, and his neighbors. What do the Knights do? Over the course of the year, you can find us bringing parish donations to Mount Carmel Guild, holding bingo games for the elderly at the local nursing home, collecting funds for children with special needs, helping local families in need at Christmas, organizing and cooking for the annual parish picnic, preparing care packages for troops serving abroad, running soccer and basketball shooting contests for youth, and taking parishioners to Washington, D.C., for the annual March for Life. And much more! Want to learn more? Visit our Council website for information about our events and activities: https://kofcknights.org/CouncilSite/?CNO=7000. Fill out the form linked below and drop it in the collection basket to express your interest in becoming a Knight.